The Morphy Richards Accents 5 Piece Tool Set - Stainless Steel is the perfect collection of essential kitchen utensils. 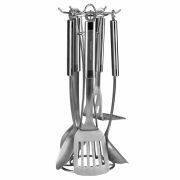 Made from high quality stainless steel for the ultimate in durability, the set contains a turner, slotted spoon, solid spoon, ladle and masher. Each component boasts an oval tube handle with colour match coating. - L.M.Features: Morphy Richards Accents 5 Piece Tool Set Made from stainless steel Each piece has an oval tube handle Colour match coating Contains: Turner Slotted Spoon Solid Spoon Ladle Masher Warranty with RKW: 1 Year.Extended Warranty: 4 Years. Valid only if item is registered within 28 days of receiving it.